Vada's Blog Stamp Inks and Paper : Vintage Christmas Greetings. I did a Google Search for Vintage Christmas cards and found this graphic along with some others. But this one just seamed to speak to me, so I sat down and after three times around, I finally came up with this. In the close up picture you can see the glimmer and sparkle of the “Atyou Spica”, pen I used. Just wanted to keep it as natural as I could, just highlighted the white with my White Gel Pen. The large “Embossing Folder and Die”, is from Cuttlebug. Thanks so much for your visit, I’m off for a few days. Should be back after we all get stuffed! Such a lovely Christmas card! So well designed and beautiful use of the image! Have a wonderful Thanksgiving, Vada! See you after you are stuffed! Vada this vintage graphic is gorgous... and the way you have used just makes it unique! Oh so beautifully, Vada!! Love it! Have a wonderful Thanksgiving! 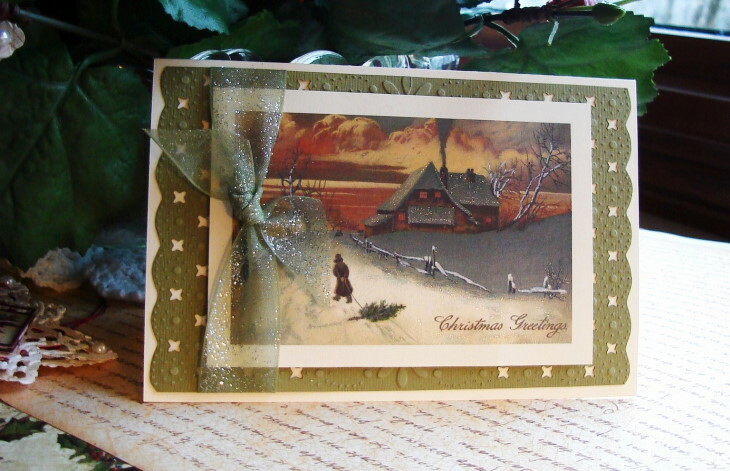 Great card - really natural with just a hint of sparkle. 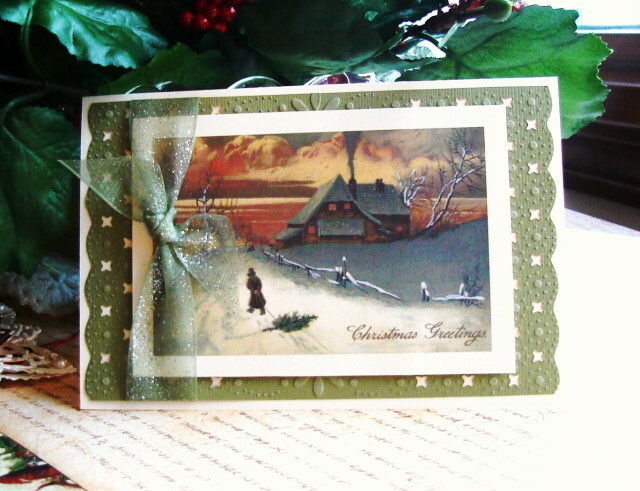 Lovely vintage style xmas cards. Came over from the Gingersnaps group. What gorgeous cards you make.